This is what gets us excited to work hard day after day. It’s what makes us the most demanding buyers of organic, medicinal ingredients. It’s what inspires our formulators to create the most potent remedies available anywhere. We want to heal you, so you can live in more joy and well-being. Forces of Nature is dedicated to doing its part in helping others and in a lot of different ways. Sometimes this takes the form of volunteer work and service, other times generous donations of money or products to those in need, support of emergency relief efforts, and professionally in the education of doctors to the benefits of natural medicine. There’s a lot to learn about nature, medicine and the development of natural medicine throughout history. Our entire philosophy is to help people be healthy. We have a lot of work ahead of us – as our Mission is to help Heal the World. Toys for Tots Program. Corporate Sponsor USA, Thailand. Annual sponsor supplying toys and medicine to over 150 children in need. Doi Suthep National Reserve top financial sponsor. Chiang Mai, Thailand. Providing food, medicine, and supplies to several hundred monks at the revered institution. Financial donations for research, medicine, and education to help manage the illness. Contributed to establishing the first charitable foundation in northern Thailand dedicated to the care of needy children. Established by Thais and foreigners who saw the need to establish this foundation after their volunteer work in Chaing Mai University Hospital in 1998. Significant corporate donations to the Thai Red Cross for supplies to aid those affected by the tsunami. Foundation for the Restoration of Wat Chedi Luang. Sponsor, Chiang Mai Thailand. Monthly donations of food, supplies, and financial support to over 100 monks indigenous to the area. Cambodian Relief Fund Foundation. 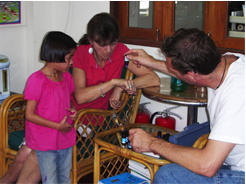 Volunteer and donor in Northern Cambodia. Assisted NGO team in the distribution of food and medicine to aid groups for malnourished children and adults in central Cambodia. Financial support to the Red Cross for purchase of medicine and supplies for those affected by 9/11. Volunteer for watchdog group to save the lives of hundreds of seals and whales from environmental toxins and human encroachment.